Bison, Elk and Venison Variety Snack Gift Box by Wisconsinmade at 365 Days Of Kindness. Hurry! Limited time offer. Offer valid only while supplies last. 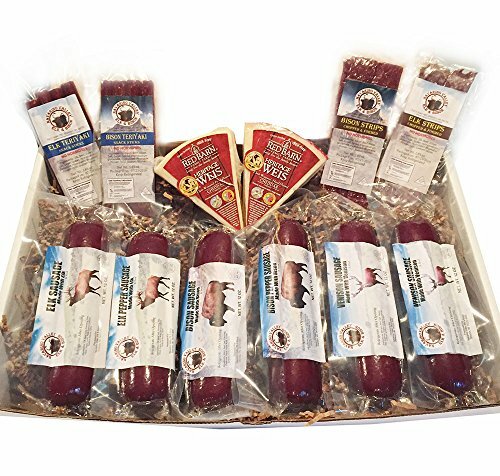 Navarino Valley Elk and Bison Ranch offers a delicious assortment of summer sausages and snacks in the Bison, Elk and Venison Variety Snack Gift Box. Navarino Valley Elk and Bison Ranch offers a delicious assortment of summer sausages and snacks in the Bison, Elk and Venison Variety Snack Gift Box. The variety snack gift box contains 2 Elk Summer Sausages (1- Original & 1-Spicy - 12 oz. each), 2 Bison Summer Sausages (1- Original & 1-Spicy- 12 oz. each), 2 Venison Summer Sausages (1- Original & 1-Spicy - 12 oz. each), 1 Elk Four Pak Regular Snack Sticks - 3.85 oz., 1 Elk Four Pak Jerky - 3.85 oz., 1 Bison Four Pak Regular Snack Sticks - 3.85 oz., 1 Bison Four Pak Jerky - 3.85 oz., and 1 Red Barn White Cheddar Cheese Triangle - 1 lb. The Bison, Elk and Venison Variety Snack Gift Box is a perfect gift for Father's Day, a birthday, or other special occasion. Savor some of Wisconsin's delicious summer sausage made with native elk, bison, or deer. Navarino Valley Elk & Bison Ranch brings you this assortment of high quality Elk, Bison and Venison products. The animals are farm raised and live in natural open pastures with free-range grazing and without the use of growth hormones or antibiotics. Elk, bison and deer meat is mild-flavored and tender. It is naturally low in fat, calories, and cholesterol. The ingredients in each summer sausage are elk, bison, or deer, beef, pork, salt, corn syrup solids, spices, sodium erthorbate, lactic acid starter culture, and sodium nitrate. A tasty variety of elk, venison and bison sausages, snack sticks, and jerky.